Image caption Cecilia Burns fought a decision to cut her benefits. A cancer sufferer, who had her benefits cut by government officials who said she was fit to work, has died. 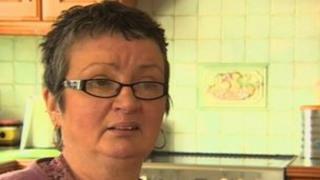 Cecilia Burns, 51, from Strabane, County Tyrone, had started a campaign in February to have the decision overturned. Ms Burns had her benefits cut after she was assessed by government contractor Atos Healthcare. She had her benefits reinstated just a few weeks ago but died on Monday. During her campaign the County Tyrone woman said she was "disgusted" after the government cut her sickness benefit and told her she was fit to work. Cecilia Burns had her Employment Support Allowance reduced by £30 a week even though she was still undergoing treatment for breast cancer. Ms Burns had described the medical test as a "joke". The government is seeking to reassess all 2.6 million people on incapacity benefit - and its successor employment support allowance (ESA) - by 2014 in an effort to encourage more people back to work and to cut the welfare bill. Stormont Assembly MLA, Michaela Boyle, had helped Ms Burns in her campaign. "I have known Cecilia since she went for her medical assessment. She received nil points and appealed that assessment." Ms Boyle is critical of the assessment process. "Our office has been dealing with the fall-out of this on a daily basis and that is mainly with the flaws. A lot of MLAs will be facing the wrath of this. "We have been deeply critical of all aspects of the decision-making process with many claimants being disallowed who have severe disabilities, chronic conditions and life limiting illnesses. "We have questioned the objectivity of these decisions given that a large number of these decisions are being overturned at appeal stage. "At 60% of these appeals, the claimant had been awarded nil points in assessment." Last week Atos said they would be reviewing their correspondence with claimants after they incorrectly told one woman that assessors were not required to be specifically trained in mental health. Later on Friday, Disabled People Against Cuts and UK Uncut will protest outside Atos headquarters in London to coincide with the Paralympics. Before her death, Cecilia Burns told the BBC that dealing with the side effects of the treatment were bad enough, but she had been angered by the cut in benefit after she went for a medical. "I know there's other people out there and they're all scared to come forward," she said. "I was treated badly. I've been working since I was 17, I've paid all my stamps, all my National Insurance. The only time I was ever sick was when I was pregnant with my two sons. "It has had a financial effect on me but it's more (that) they're getting away with it. They are just treating you like a second class citizen. That's how I feel - that I don't count, I don't matter," she said. In a statement Atos said; "We do not make decisions on people's benefit entitlement or on welfare policy but we will continue to make sure that the service that we provide is as highly professional and compassionate as it can be. "We do this through a constant programme of training and education for our staff, a rigorous recruitment process for healthcare professionals and through continual work with the Government, disability rights groups, healthcare professionals and those going through the process on the ground." Meanwhile, in Northern Ireland, Social Development Minister Nelson McCausland has organised a public consultation on the changes. He said said during previous stages of the review, the public response was limited and it was important that people got across their views.